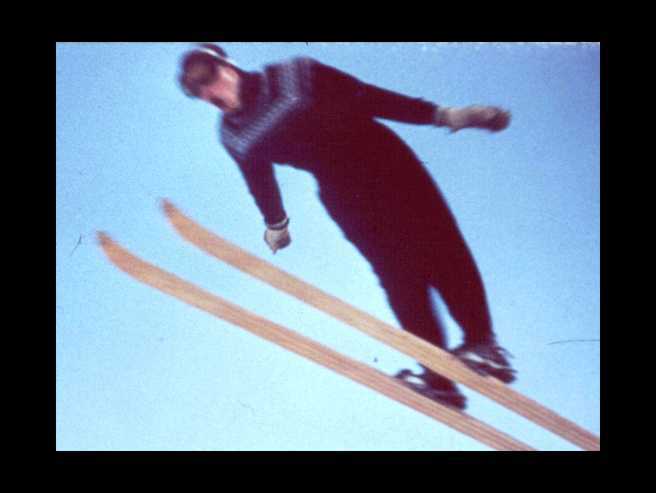 Yesterday I received an E-Mail from my geezer friend Allen Bushnell with a photo of a ski jumper attached. The photo (see above) was from his days of ski jumping in Wisconsin probably 60 or more years ago. Over many years Allen has regaled me about his adventures as a ski jumper and the fact he never got the recognition he deserves for his youthful exploits. Allen, maybe those many falls on your head has addled your memory of those days. However, hats off to anyone that has the courage to go off a ski jump and sail into a crash landing on the run out. I have heard from Allen the tragedies of sailing too long and landing hard on the flat. Allen, you are a most interesting geezer and we all honor you for your exploits both on the ski hill and off. Allen was drafted during WWII as a skinny little kid and matured with duty in the U.S. Navy. A talented artist he was able to get duty using his skills after he had suffered the indignity of garbage scow work. Upon leaving the Navy he was educated in design, had his own design business and later gravitated to teaching both at the Crane School of Design in Milwaukee and later with a distinguished career at Cornell University. He had the good sense to marry Ruth who deserves sainthood for keeping him in line for over 50 years (I think). He and Ruth have raised three boys David, Peter, and Paul that are outstanding citizens and professionals. Two engineers and one architect. As an 80 plus geezer Allen he is a highly disciplined physical fitness guy. At our coffee breaks on the hill at Greek Peak he keeps trying to teach us belly dancing with the claim it is great for the abdominals. We should all be as fit as Allen at 80 plus. Keep flying Allen, even if it is only down the slopes at Greek Peak and I'll keep listening to your stories on the lift just as long as you finish them when we unload. He would have "flown" another 10 meters if he had his mouth shut!